Claire Taylor, the leading run-scorer in England's recent victory in the Women's World Cup, has made further history by being named as one of Wisden's Five Cricketers of the Year. 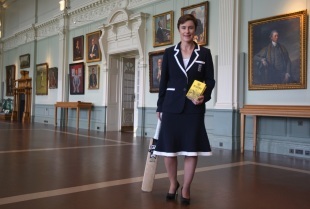 She is the first woman to receive the accolade since Wisden introduced its honours, 120 years ago, in 1889. Taylor, 33, made 324 runs at 64.80 as England beat New Zealand by four wickets in Sydney to win the World Cup for the first time since 1993. Her fellow Cricketers of the Year are the England bowler James Anderson, Durham's Dale Benkenstein and the South African pair Mark Boucher and Neil McKenzie. Taylor and the England team had been in magnificent form leading up to their World Cup triumph: early in 2008, they retained the Ashes by winning only their fourth Test in Australia; they then went through the entire summer undefeated. Taylor was instrumental in both achievements, and established herself as the leading batsman in women's cricket after sealing victory in the Bowral Test. Scyld Berry, the editor of Wisden Cricketers' Almanack, said: "Beating Australia in Australia is the objective for all cricketers, at least in England, and Claire almost single-handedly saw England through to victory and the retention of the Ashes in Australia last year, not to mention her success in the World Cup just a couple of weeks back. It would be a sin of omission, an act of prejudice, to exclude her from the accolade. "The England women have been the pride of the nation as far as cricket is concerned in recent years, and Claire's nomination as a Cricketer of the Year is testament to the sterling effort the ladies have consistently put in. "James Anderson has been England's most reliable pace bowler in the last year; Dale Benkenstein guided Durham to their first Championship, while Mark Boucher and Neil McKenzie were the backbone of the South African side which defeated England last summer."